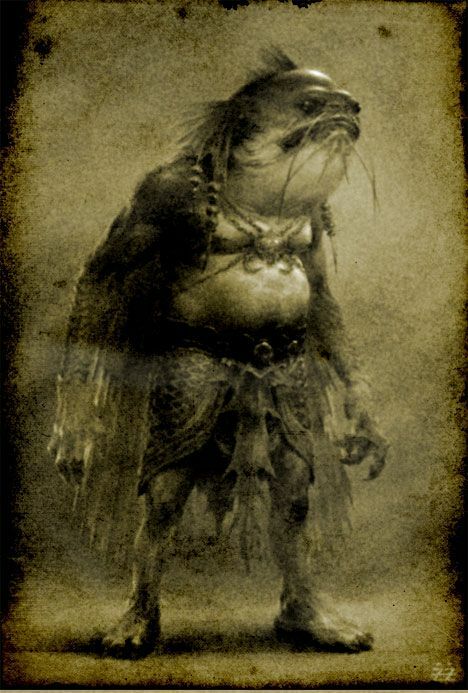 Dagonians are the product of ancient interbreeding between two species: human beings and a bipedal race of sea-dwellers (known by many names, including the term “Deep Ones”) whose appearance mixes elements of frogs and fish alike. 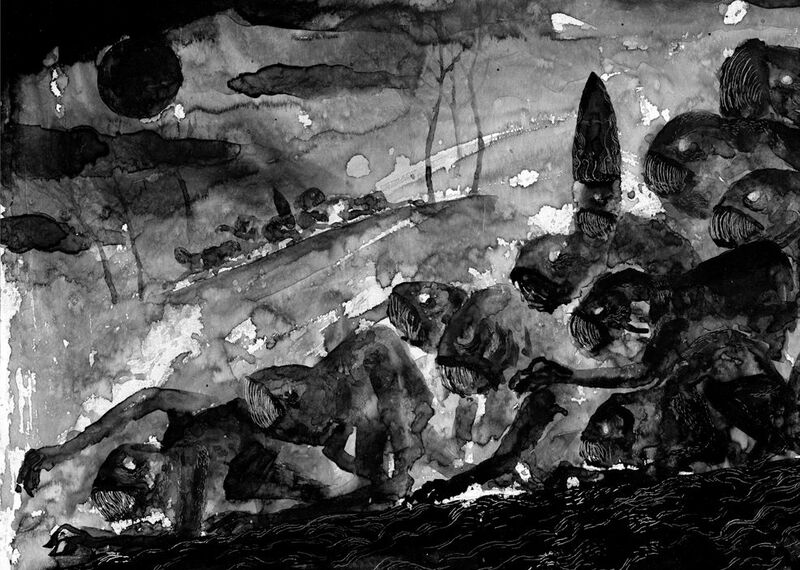 Usually, it is quite far back in the Dagonian’s ancestry: rarely is a Dagonian in the present time the child of such an interbreeding, and it is never human enough to escape destruction when others are present for the birth. In our campaign, race does not function as class. A Dagonian is equivalent to a human, and has almost all the same class options: they can be members of any of the main character classes: Magic-User, Specialist, or Fighter—or, very rarely, a Cleric. A Dagonian cannot also be an Alice, Revenant, or a Changeling. However, regardless of Dagonian’s class, she rolls Saving Throws as Dwarf of equivalent level (see the Rules & Magic book for the chart). Dagonians are also automatically +1 to Strength and Constitution, and -2 to Charisma. They will have a minimum of 13 Strength. They also automatically are able to swim at a rate of movement equal to their normal rate of movement, and if they need to, they can swim as quickly as they can run for up to 5 minutes per point of Strength they possess. They can automatically sense where the nearest body of water is. They can see in the dark (“infravision”), but also suffer from reduced long-range vision as a result of their eye structure. The typical Dagonian only looks vaguely marine, hints of the inhuman side of their ancestry peeking through. The sculpture/photograph is by Casey Love. Click the image to see more. Sometimes it’s even more subtle, and looks just like hyperthyroidism. Bulging fishy/froggy eyes, and a tendency not to blink very often. A greenish tinge to the skin. 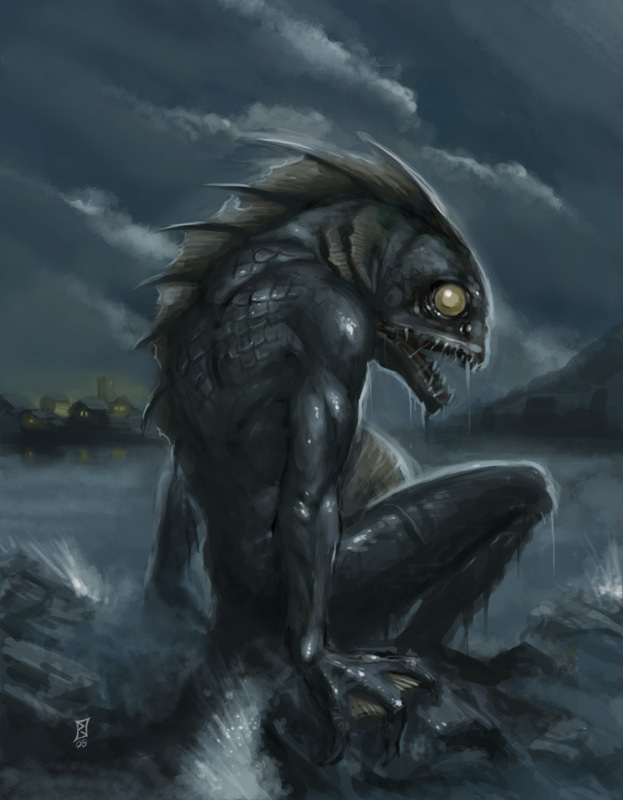 A fishy odour that does not wash away, and in fact increases when the Dagonian is wet. Dietary restriction: the character feels ill (i.e. does not heal damage, and loses 1 hp per day) unless her diet consists mainly of raw fish and seaweed. Thick, claw-like nails on hands and feet. A deeply sunken nasal bridge. Sharp, spiky teeth like a fish. The spiny nub of a tail with a ridge on it, like a fish’s fin. A spiny ridge with fins along the character’s back, making it impossible to wear normal shirts. Pseudopod limbs: the bones in either the character’s arms or the legs soften over a period of weeks, and the limbs begin to resemble tentacles. Doubles character’s swimming speed, but reduces onland movement rate by 50% if the legs are affected, and makes fine motor manipulations with fingers impossible if the arms are affected. Tentacled face: the character sprouts a ring of pseudopods around her or his mouth, which grow over a year to a length of 30 cm. For the first six months, the tentacles may be hidden in facial hair on male characters. Two traits: roll twice on this table. 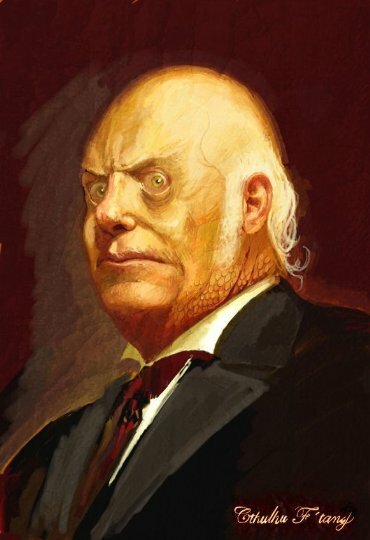 For a result of 18 or higher, the Referee should either choose a trait the character does not yet have, or design yet another other awful Deep One trait to give the character. Leaps and Bounds: Large, powerful legs that allow her to swim at double normal speed, or leap/bound 30′ in any direction. Horrify: for each Inhuman Trait she reveals to an NPC, that NPC suffers a -1 penalty to all Morale checks. Exotic Charm: as long as she keeps her Inhuman Traits concealed, the PC can add +1 per concealed trait (as a Charisma bonus) to all rolls involving social interactions (and +2 on all attempts to seduce of backwater hicks in cruddy coastal towns). Sea Sense: by immersing herself in sea water for ten minutes a day, the character can judge sea routes and the accuracy of navigation with a high degree of precision. Sea Ears: for each twenty minutes spent immersed in sea water (for up to an hour), the character can add +1 (to a maximum of +3) to all Lore checks related to anything Dagonians and/or Deep Ones would know about. Ocean Call: able to summon aid from the sea, in the form of any creature of equivalent number of HD to the character’s current level, once per day. Dagonian Whisper: The Dagonian can sense the Dagonian nature in others, even those who are themselves unaware of it, and provoke its manifestation in them, bestowing one Inhuman Trait and one Gift of the Deep to the other simply by speaking with her about Dagonians for at least 1d6 minutes. 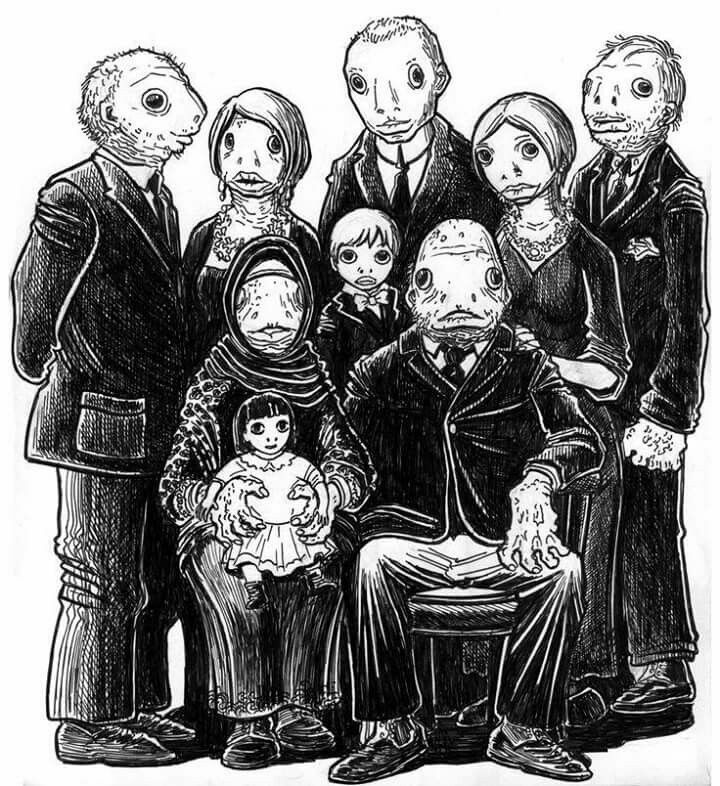 A Deep One… if your character is a Dagonian, this is his or her great-grandma or great-great-grandpa… Image by Pahapsi at Deviantart, click for source. 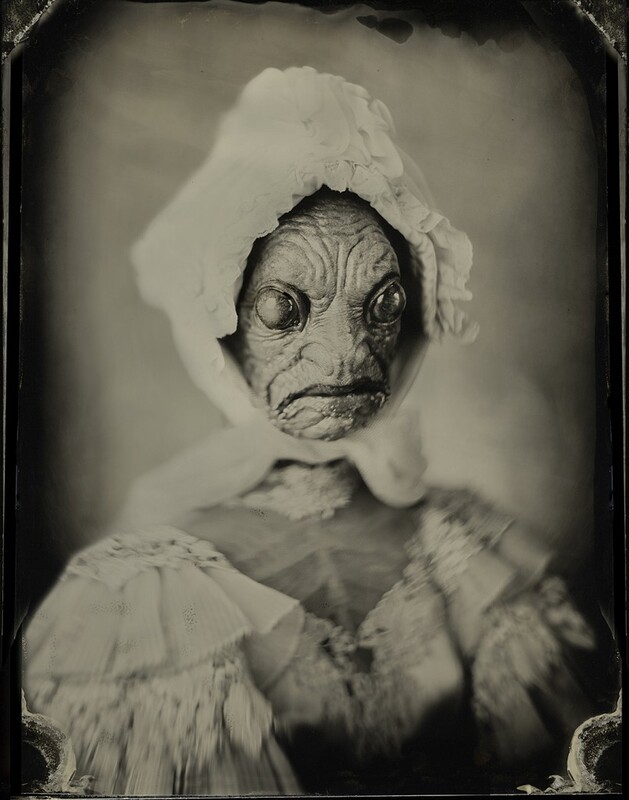 Most Dagonians grow up unaware of their traits, living in seaside communities. Those who do discover them, often do so in traumatic circumstances: for example, falling into the ocean from a fishing boat during a terrible storm that has claimed everyone else on board, or during a flood. Many a Dagonian has been shocked to discover that she or he can breathe water… and then even more shocked to discover the physical changes that followed this discovery. The more a Dagonian refrains from using his or her racial abilities, the fewer Inhuman Traits she or he will display. However, the more they are used, the more Inhuman Traits will develop. In game terms, the player must roll a Saving Throw vs. Magic each time use is made of a Dagonian Gift of the Deeps (or, until she is 2nd level, any Basic Racial Ability). Failure means the character accrues one more Inhuman Trait that will manifest over the next 1d4 nights of sleep. These portraits are by Joshua Hoffine. Click the image to see more of them! Once a Dagonian has too many Inhuman Traits to easily pass for human (typically 5 or more), she is also typically filled with intense longing to “return” to the sea, where she knows a city of those like her dwell. She may choose not to go there, but will be unable to completely ignore the sense of longing. 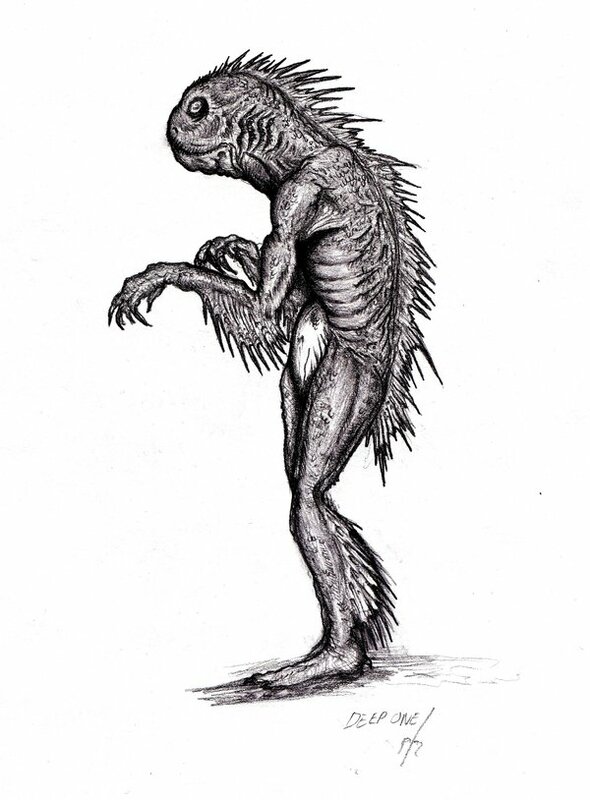 A Dagonian who succumbs to the Call of the Depths may return to play—usually a level higher, and with at least one more Inhuman Trait than before (and no more than two), but, if she or he has spent a month or more in one of the underwater cities of the Deep Ones, will emerge having gained 1-3 points of Wisdom and lost 1-3 points of Charisma. 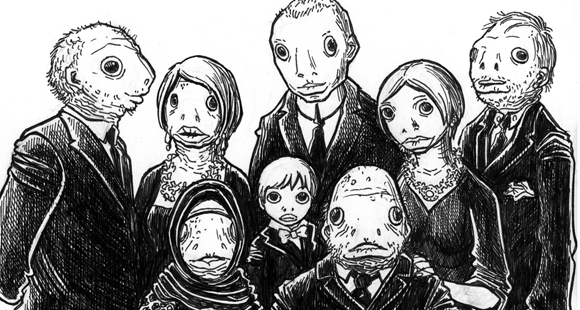 This is what it’s like down under the sea: this piece is titled “View of Innsmouth” by Alberto Vasquez. There are Dagonian villages found all over the world, always small and remote, and always with a population doing its level best (and, ultimately, miserably failing) to blend in and go unnoticed. 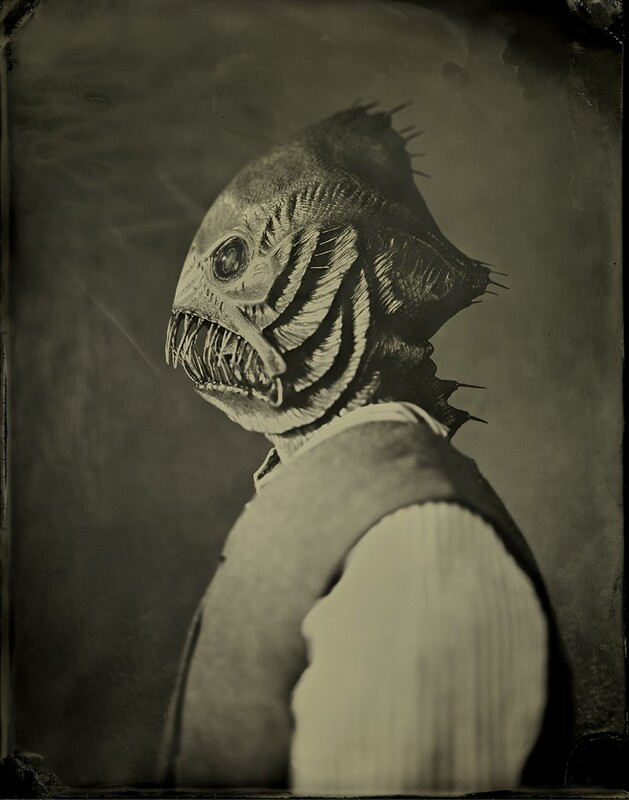 Given that passing for human is the normal modus operandus for Dagonians, they do not learn the Deep One language until after having succumbed to the Call of the Depths; rather, they tend to speak the language of the surrounding culture, albeit usually in an awkward, stilted fashion. 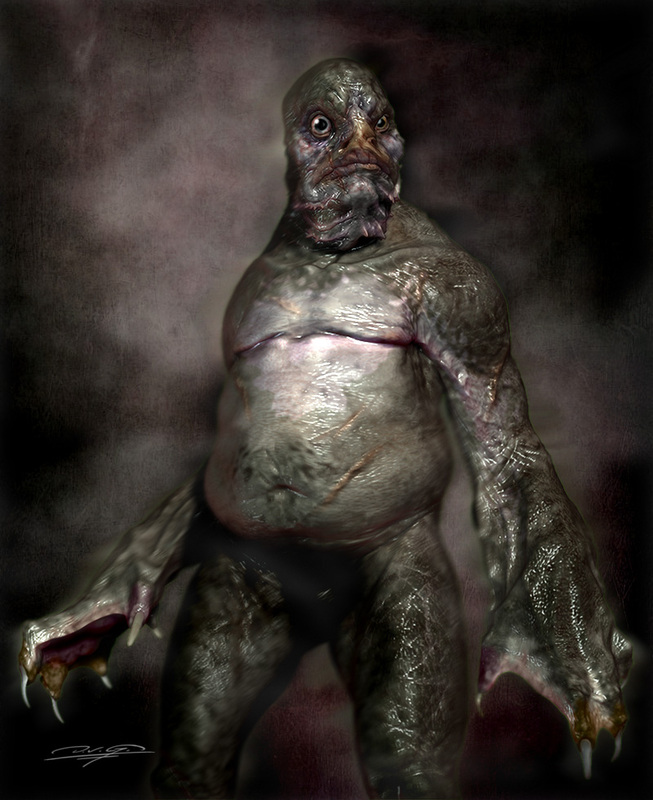 Above a certain age (usually, in their late twenties or early thirties, when their Inhuman Traits begin to become too apparent to ignore), Dagonians are initiated into the secret of their bloodline, and taught that they shall be reunited with their “true” ancestors, the Deep Ones, when they have grown old and powerful enough to withstand the journey to the bottom of the sea. Most Dagonians simply accept this fact, and eke out a living as fisherfolk, duly waiting until they will become inhuman enough to set out on their voyage toward the promised land that lies in the dark depths of the ocean. Even among those Dagonians who reject this fate—as almost all Dagonians who take to a life of adventuring do—there is often a hint of fatalism, as if one’s fate really is ultimately beyond one’s own control. After all, nobody asks to be born with monstrous blood running through one’s veins. But most Dagonians who flee the life-plan foisted upon them by their circumstances also have a sense that they can, perhaps, achieve some degree of freedom—if not glory and fame, or power, or pleasure, or perform real good in the world—along the way. For this reason, while many Dagonians are of Chaotic alignment, PC Dagonians can choose whatever alignment they wish. 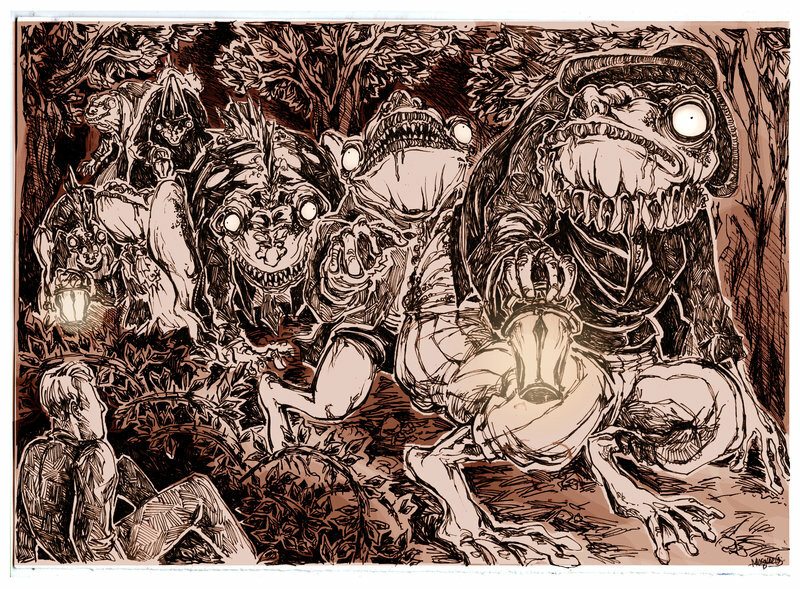 Oh, one more thing: a Dagonian can easily spot the tell-tale signs of an incipient Dagonian, but they don’t have any magical power that allows them to automatically sense one. If a given Dagonian has somehow managed to cause all of his or her Dagonian traits recede, then she will be indistinguishable from a normal human being, even to other Dagonians.